Dawntastic: My 5th & Frolic "Kit"
My 5th & Frolic "Kit"
I recently discovered Studio Calico's Card Kits. I thought what a great idea and a good way for me to learn more skills and try embellishments and paper combos that I wouldn't normally. Then I thought, "I can make my OWN kit for that price!" So I did (I did end up subscribing to Studio Calico's kit too...). I tried to choose things that went together but were things I wouldn't normally buy or use. I've never used washi tape or those dot embellishments. Nor do I use printed paper packs. I'm not sure I would have picked that Avery Elle die, but I LOVE it. Suddenly my card making options are so expanded! Oh, I even bought my first Mister Huey's spray in white. So how did I do on price? Well, retail (without shipping) for all these items adds up to $31.25. (If I subtract the Mister Huey spray, it is $25.75 retail w/o shipping which is pretty reasonable.) Of course not everywhere had what I needed in stock so I had to pay shipping from multiple places. So, I definitely didn't make out like a bandit! But, Studio Calico is advertising their card kit membership plus shipping as $32.75 a month... If I could have purchased all of these items from one place, I may have got free shipping. Simon Says Stamp was having a sale while I was hemming and hawing so things kept going out of stock. I also want to note the stamp set is acrylic (costs less) and not photo polymer which I was a bummed about. 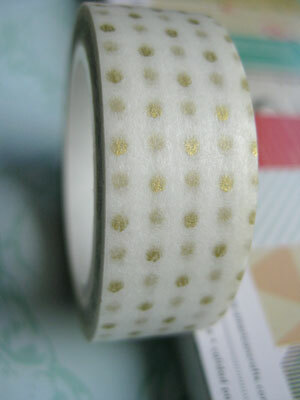 Here's a close-up of that lovely washi tape! I also ordered a few extras for my "kit". 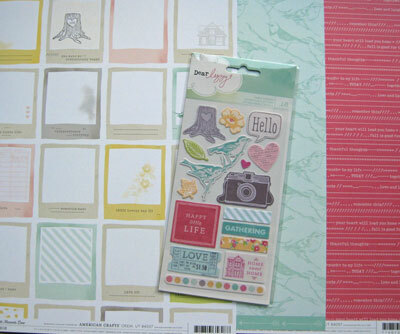 I got various 5th and Frolic 12 x 12 two-sided scrapbook paper and some fabric stickers from the set. Well, there you have it, my attempt to make a kit just for myself. I did ok, but it took a lot of hours to figure out what to put together. 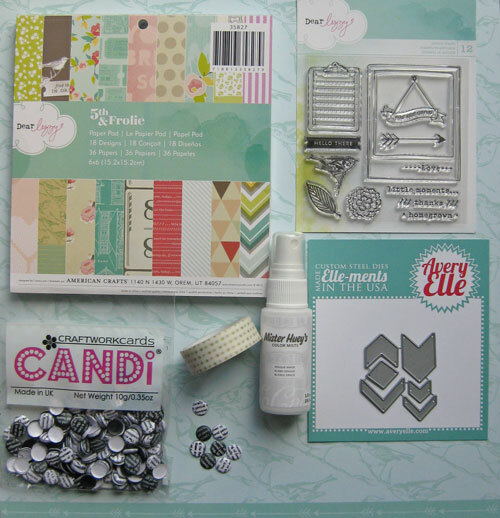 I'll stick to the Studio Calico kits for now -- They do the work for me and they include photo polymer stamp sets. I also think that the Studio Calico kit paper is made in USA vs. the made in china of the 5th and frolic paper. **I don't know for certain that the Studio Calico kit paper is made in USA, but a retail pad I have of theirs is.